ISO Recorder (or ISORecorder) is a PowerToy tool for Windows XP, Windows 2003, Windows Vista and Windows 7 that enables (depending on the Windows version) users to burn or write CD and DVD images (DVD support only on Windows Vista and Windows 7) to disc, copy disks, create or make images of the existing data CDs and DVDs, and create ISO images from a content of a disk folder. ISO Recorder addresses one of the major disappointment and fill one of the most requested need in Windows operating system – that although the OS supports burning of data files to CD (and DVD for Vista), Windows missing feature to deal with CD and DVD image. That’s Windows does not support nor has the ability to record an disc image. ISO Recorder does not have CD or DVD burning, writing or recording engine. Instead, ISORecord uses existing Windows feature that support writing to a CD or DVD disc, which based on Roxio technology. However, ISORecorder has some broken functions such as cancel burning process doesn’t actually works, doesn’t accurately honors the writing speed set in Windows Explorer recordable drive properties’ Burn Writing setting, and doesn’t allow disc-to-disc copying of audio CDs. It also supports DVD writing and burning in Windows Vista and Windows 7, including bootable DVD, but is not supported in XP. Both administrator and standard user accounts can run ISO Recorder. 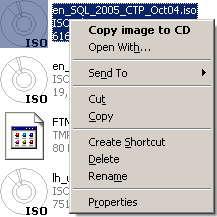 Once installed, ISO Recorder will integrate several context menu items and commands into Windows shell, such as “Copy Image to CD”, “Copy CD to Image File”, and “Copy Disk to CD”, which allows users to burn ISO images to CD/DVD disk, create ISO image from CD/DVD disc and fast duplicate CD/DVD. In Windows Vista (version 3), users may have to use “Open With” right click contextual menu and then select “ISO Recorder” to write an ISO image to disk.